In 2-quart saucepan, combine water and taco seasoning mix; mix well. Bring to a boil, stirring occasionally. Add vegetable protein crumbles. Cook over medium heat for 3 to 4 minutes or until slightly thickened, stirring frequently. Remove from heat. In large bowl, combine lettuce, tomato, bell pepper and cucumber; toss to mix. 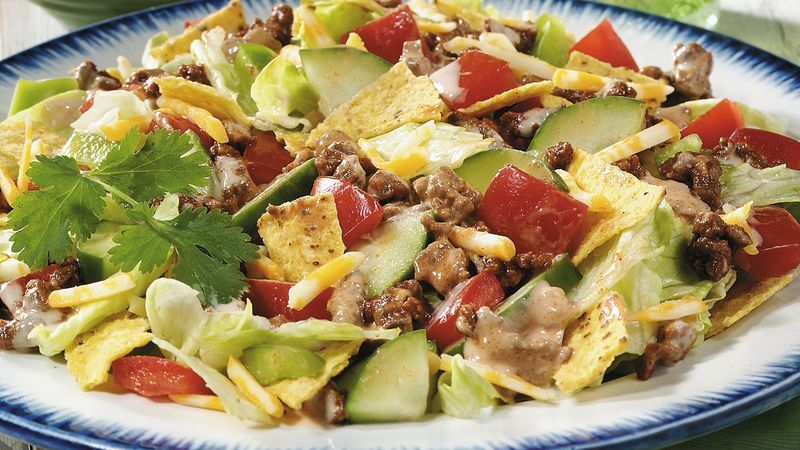 Just before serving, add vegetable protein crumbles mixture, cheese, salad dressing and chips; toss gently to coat.